Last Saturday, I hitched a ride with a friend to London and spent a few quiet hours strolling the streets, food gazing, talking to strangers (the result of working from home and never having an opportunity to verbalize one's thought), reading a book at a cafe, people (and shoe) watching, admiring charming townhouses and calculating how much a kidney is worth these days. I pinch myself every now and then, to remind myself how lucky I am to live so close to London. Far enough to appreciate the countryside and not feel overwhelmed by the fast paced city but close enough to pop over whenever I get the urge to. 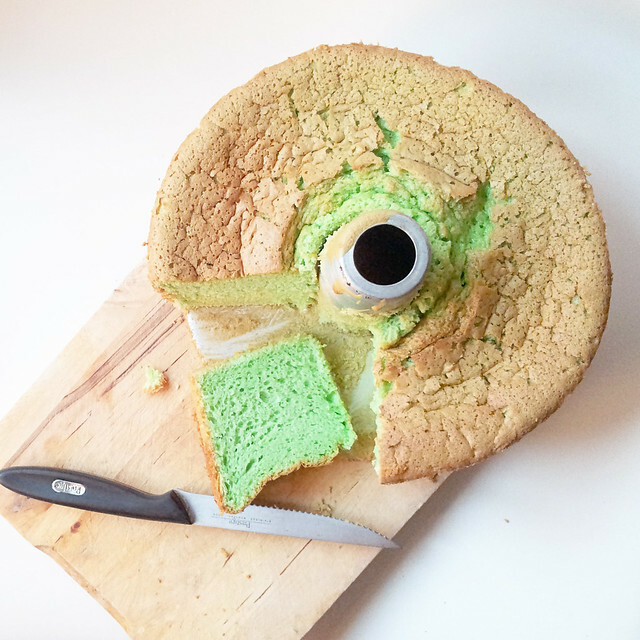 After being nearly driven mad by a child who kept haranguing me to bake the Pandan Chiffon cake, I decided to give it a go. 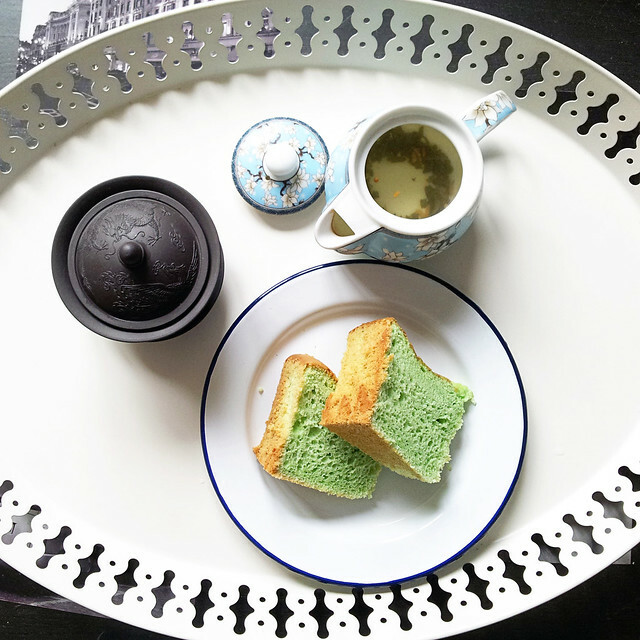 It's a fairly common cake in Malaysia with its airy, sponge-like texture along with the aromatic pandan (screwpine leaves) and coconut flavor. My sister bought the cake tin and paste for me a few years ago and I finally got around to using them for the very first time yesterday. It's actually fairly easy to bake so if you're keen to give it a go, here's the recipe. 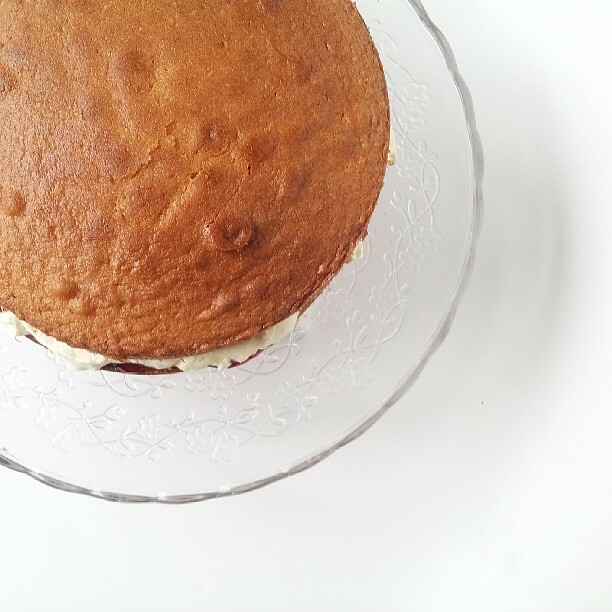 Well, since the oven was still pretty hot, I decided to bake a Victoria Sponge as well. We had to forego dinner after a cake gorging session. After much googling, I found out that you could make your own self raising flour by simple adding 2 teaspoons of baking powder per every 150g of plain flour. Pretty neat, huh? Oh and I love that little shop of MB's in Church st, I used to love going in to choose my Christmas present but it's so so tiny. I did an almost identical walk the Saturday before! The houses are amazing around and I was wondering how much a stepson might get on the black market. You made me choked on my drink! I think a stepson will fetch far more than a kidney. Looks delish! I need to bake more often! 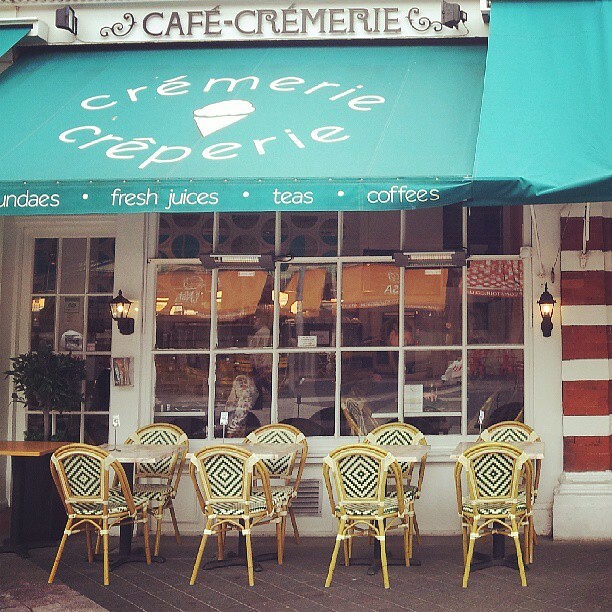 Crémerie Crêperie is delicious- it's always on my list of eats along with Rose Bakery. So glad you got a chance to spend a few quiet hours walking around London. 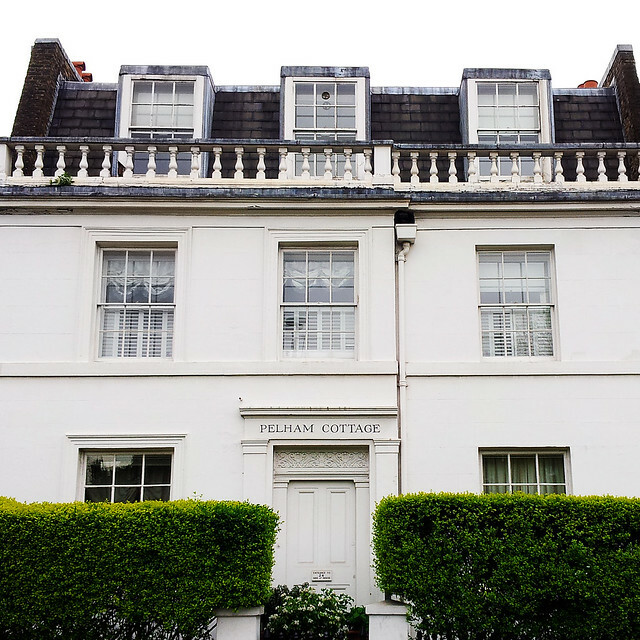 A gorgeous walk with beautiful houses along the way is always energizing. 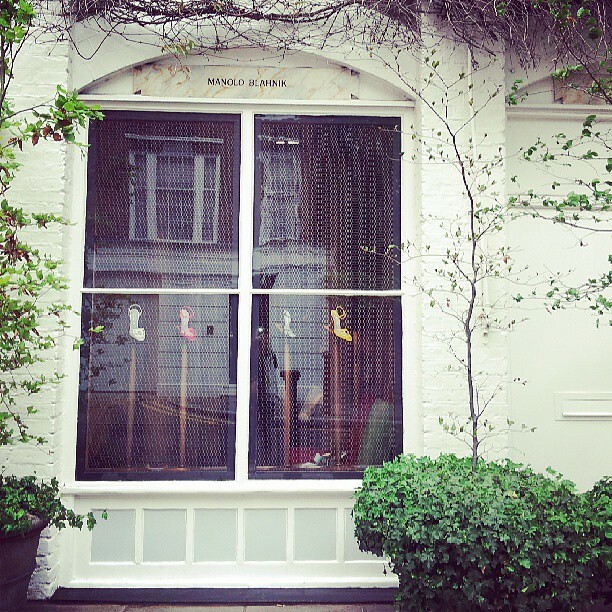 All of the Manolo Blahnik boutiques are so charming with their little terraces. I always love popping in. How lovely to have some time to yourself and stroll around the streets of London. I can't think of a better way to spend a Saturday! oh my gosh i think i just drooped on my laptop. That looks so divine! xO! Yum, you're a good Mama, have never heard of that green and yellow cake, looks wonderful. You are so lucky to have the best of both worlds. I could not do without shops (civilisation!) nearby but too tricky to live with child in a a city. Manolo Mothership has come in! Skipping dinner because of cake is pretty much how I spend at least one weekend a month. So don't feel guilty, though I am positive you didn't have time to because it looks delicious and moist. I remember how silly I felt about the self raising flour trick too. Now its my little secret to save on groceries.. Such stunning photos. I hope all your followers here are following you on Twitter as well so that they can get to see these and so much more on a regular basis. Little tweets of loveliness! I wish I could have a piece of your cake! Looks delish!! I adore white buildings with green hedges! Sounds like a lovely weekend. Going to try that baking powder trick with my gluten free plain flour - fingers crossed! I love these cute pictures and that cake looks so delicious, very yummy!!! I love pandan cakes and yours look good!